(Erick Erickson – Daily Wire) In 155 AD, Roman authorities ordered a man named Polycarp to burn incense for the Roman Emperor. Witnesses say the local authorities begged Polycarp to comply, some even acknowledging it was a meaningless act. But Polycarp refused. “Eighty-six years I have served Christ, and He never did me any wrong. How can I blaspheme my King who saved me?” Polycarp announced. The Roman proconsul had a pyre built to burn Polycarp. Eyewitnesses say Polycarp told the proconsul there would be no need to tie him to the stake as he would not flee. Others claim the flames would not touch Polycarp so the proconsul ordered him stabbed through the heart. Polycarp’s refusal to do what others told him was meaningless because he viewed it as an affront to his faith is a good lesson for Christians when confronted with the open and increasing bigotry against people of faith in the United States. He continued, “The intolerance of the LGBTQ ideology toward any alternative views is mind-blowing. 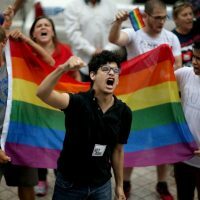 The tactics of some in the LGBTQ movement toward dissent is an existential threat to freedom of expression. The lack of tolerance for disagreement, which has been replaced with bullying Twitter mobs promising ‘consequences’, should be a concern regardless of your political stance.” The LGBTQ community then proved him exactly right and demanded his termination. CrossFit bowed to the mob and terminated Berger for daring to express his personal views on his personal Twitter presence.